After losing 3-2 mid-week to promotion contenders Amotherby & Swinton, Cliffe Reserves ended their season on a positive with a comfortable 2-0 win at home to Bishop Wilton. Cliffe went ahead with a spectacular 25 yard half-volley from Ian Beckram before Kev Taylor sealed the win in the second half with a cool finish. In a game where Cliffe could of won the game easily in normal time. 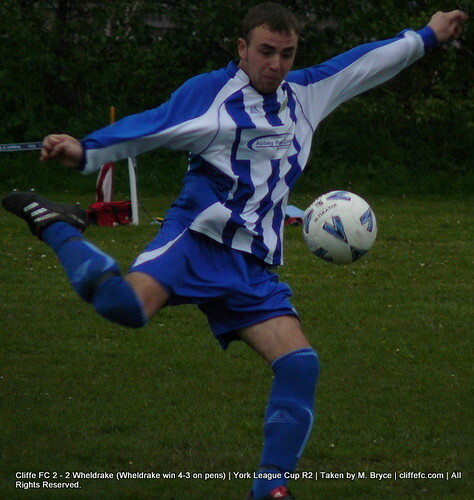 Cliffe lose their forth penalty shoot-out in-a-row to a Wheldrake side that are fast becoming Cliffe FC’s bogey side. Wheldrake took the lead within 90 seconds as Cliffe came out slow from the blocks but from then on Cliffe were the better side as with some good work from Scott Birch and Kev Taylor lead to Ben Rawson to use his quick feet to equalise and Rawson put Cliffe 2-1 ahead in the second half. After Cliffe wasted a few chances trying to walk the ball into the net, Wheldrake equalised in the 90 minutes taking the game straight to penalties where Wheldrake’s ‘keeper won the game for his team. These two games draw an end to a disappointing season for Cliffe FC, where for the first time in their short history come away with no silverware. Next stop for Cliffe FC is their first ever club tour where they will be playing two friendlies in Blackpool this weekend on Saturday and Sunday.